I am in desperate need of everyone's help. I will try to keep this brief. I have been a dog owner my whole life so I have some experience. This time I don't know what to do. All of you here have always been helpful. I need you to help me find an answer if you don't know please ask your friends and family. I have a two year old dog medium size. He started having seizures about 3 months ago. After the first one I took him to my vet. I was basically told "it happens sometime, etc." I mentioned that 7 days previous I had applied Frontline Plus, but this was shirked off. No more seizures so I started to relax. I applied the next month's Frontline Plus and guess what, a seizure in the morning and two more in the afternoon. Yes 7 days to the day of the application. So I got on the net and saw where this is happening to other dogs as well. It is not acknowledge by Bayer anywhere that I can find, that their product can have this affect. I have other dogs I have used it on for many years and they have never had a problem. I phoned my vet and was told not to use the Frontline again and we would try Advantix the next application. Well the time is here and the dog definitely has fleas (on top of the seizures it apparently isn't working either). What I need to know is has anyone else had this problem and did the Advantix cause seizures as well? Anything you can tell me about Frontline Plus or Advantix will be greatly appreciated. Since Bayer, the parent company of both meds does not acknowledge that there can be issues I don't know if my dog is sensitive to one chemical or if he would be sensitive to any of the chemicals. I live in the country so I really need a flea and tick preventative. Thank you so much. I don't know what chemicals can cause seizures but I won't use them. What I do use is food grade diatomaceous earth, available at home improvement stores. Be sure to get food grade and not pool grade. It is usually with garden supplies. It will not hurt people or pets, just rub it on your pets. It works because it is tiny bits of natural stuff that cuts the fleas and ticks and causes them to dehydrate. Our local Garden Guy has even put some in his mouth on TV to demonstrate the safety of it. You can spread this stuff everywhere and it will do the job. Check out Dave Owens the Garden Guy web site for other useful ideas. We discovered that our dog has seizures and started keeping a log book. We quickly noticed that shortly after applying Advantix, her seizures increased considerably (more than 10 seizures over the course of just 2-3 hours). I discussed this with a neurologist who recommended Bravecta instead, and that has been a lot better for our dog. I also discussed the issue with our regular vet who told me their clinic has stopped using Advantix entirely. They had two instances of dogs having seizures right in their office shortly after receiving Advantix. These were dogs that didn't even have a history of seizures. My guys would be "off" for about a week after I had applied the Advantix. They never had seizures, but they were definitely not happy with the treatment. I'm with desertgal on the DE. But in addition to that there is a product called Bug Off Garlic made by Springtime. It is a food supplement for dogs that once in their system the fleas and ticks do not like the taste of. So far it has been working for me this season. Garlic builds up within a dog's system and will eventually become toxic, just like chocolate. Do not feed garlic to your dog! Best friends dog died because of monthly flea treatment. Cancer of the spine which company won't admit to. Diatomacious Earth (food grade only) is wonderful, natural and when used in their food, rids them of intestinal worms. Very pleased with my order from earthworkshealth.com. Fast shipping and only about $9 gallon jug. I would rid the house of fleas with 20 Mule team borax. I too hated applying insecticide to my dogs' skin. My vet told me about a new product on the market that you might want to try. It is called Comfortis. It is made up of good bacteria that kills fleas and is taken once a month orally. No insecticide! Ask your vet (frankly with a vet that says "it just happens sometimes" when your dog is having seizures stinks. I would find a new vet first and foremost!). Look it up online and see what you think. Anything is better than those topical solutions. Frontline and Hartz are the worst! I took my dogs off Frontline several years ago because it just did not work. I asked my friend what she used and she said Advantix. I have been using it since when I have observed fleas. I've seen no seizures and I have observed no odd behaviors. We have less of a problem with fleas since we moved to a place with pretty low humidity. It's either that or the fire ants that has kept the fleas away! I have two golden retriever males, aged 7 years, and started using Advantix11 on them. Last treatment and this month's treatment, one of my golden boys had a seizure within two days of application. I'm convinced this is caused by this treatment. Will move on to something else now. I applied advantix yesterday morning to my chihuahua, this morning she had a seizure. She very occasionally has had seizures in the past ( 1-2 per year). I'm not consistent with the flea medication because we didnt have a flea problem in our area. This past summer there was a flea epidemic, we used the flea drops as advised. Also her seizures became more frequent. I never thought the flea drops would be the cause. I will monitor her behavior with the next application and hopefully determine if this is her seizure trigger. I say YES! A few months back I changed to Advantix at the recommendation of a vet after both dogs got fleas. Sometime around the same time my Dachshund/Jack Russell Terrior mix had a seizure. This can be a very scary experience! The vet said could be epilepsy. About a month later another seizure. Our vet said we could give the flea medicine every 2 weeks for awhile. A couple weeks later another seizure. It was about that time that I started putting 2 and 2 together and thought... could it be the flea medicine. But I didn't do any research at that time. I've gone a couple months without giving flea medicine until last week. Guess what, this week my Bella has had 2 seizures. I am absolutely convinced it is the Advantix. My other dog, a Yorkipoo, does not have seizures, but he is very disturbed when I put that medicine on him. Never again will I use this product. I'm at a loss how to prevent fleas, we are in Florida and definitely need to do something. I just read one post that talked about Comfortis... anyone else have an opinion or testimony for that product or anything else that is more natural and will not harm my dogs. Thank you. Yes! Comfortis is amazing I have used it for years with no problems! I was talked into advantix about a month ago and not even 12 hours after the application my dog had a cluster of almost 30 seizures within a 12 hour period, we took him to a 24 hour vet because it was in the middle of the night and they put him on IVs and charged us an outrageous amount of money there's no doubt in my mind that advantix did this! This medicine should be taken off of the market!!! I have always used advantix but a few months ago i gave my 4 dogs advantix, but this time i Accidentally put it at the base of my 7 yr old border collie's had rather than further down neck. Two days later he took his first seizure. After MRI and spinal fluid tap it showed up nothing, so vets put it down to epilepsy. No seizures for a few months until last week. He has now had 3 seizues a few days apart, but i am convinced it was the advantix that caused his epilepsy. He always hated getting the drops and now i know why. I used diatomaceous earth food grade in their food and on their coat for over a year now with advantix but have quickly ditched advantix. Now just using diatomaceous earth and apple cider vinegar with mother. Vets and specialists deny advantix cause seizures but there are too many dogs having same issues. A few years ago i took my border collies off heartguard because after some research i found out that for some reason reason border collies and some other dog breeds are allergic to ingredients and many dogs have died. So dont be fooled by heartguard having picture of border collie on the packaging. We had to stop using Advantix 2 when my Goldendoodle, Mason had 3 seizures in one day, approx 36 hours after our application of the Advantix 2. We called the toll free number for Med emergencies on the Advantix box and the Bayer rep said to stop using the product. We were given instructions to wash the product off with dish soap. I spent 2 hours with my dog in the shower that night soaping and rinsing him thoroughly. He has not had another seizures since that episode 2 weeks ago. Mason is 5 years old and was diagnosed with epilepsy when he was 2. We used to only treat him with potassium bromide but a cluster seizure 2 years ago forced us to increase his meds to using a low dose phenobarb and Keppra and potassium bromide cocktail. His seizures have been under control ever since then, He had only had a mild seizure every 1 or 2 months. After the Advantix 2 was used- those were the worst seizures we have seen comparable to when Mason was unmedicated. I am quite positive the Advantix 2 caused his seizures and I think that product should be taken off the market. Since seizures are listed as a side effect I think Bayer should at the least recommend that their product NOT be used on dogs with epilepsy. Our dog eats an all natural dog food and we generally stay away from products that have chemicals and especially have warnings about possible seizures. Ticks have been so bad this year we slipped and mistakenly believed the marketing ploys out there. Mason has always used the standard heartworm treatmeat using ivermectin/pyrantel for 6 months/year and so far seems to have no problems beyond his epilepsy. Please be careful and good luck with your treatments. Spent today reading up on seizures. Most sites said that people had to stop both flea and tick meds, as well as heartworm meds. EVERY brand of BOTH types of meds can cause seizures according to all I have read. Personally I am VERY angry with my vet as we asked if it could be the flea and tick or heartworm meds when Marcus' seizures started. We were told no. So we kept giving them. I so wish I had checked the internet but we were told there was a lot of misinformation there. I'm really angry w/ myself too, for not checking anyway. It has been 2 yrs. and Marcus has horrible long seizures and is not the same dog now. He appears to have some problems from his very long seizures that the (same) vet was surprised he survived. We will be changing vets, to say the least, which isn't easy in our rural area. We will also be going with natural flea and tick remedies starting with diatomacious earth. Not sure what we'll do about the heartworm meds, but will be doing more research. At least our dogs are inside most of the time, except for walks and potty breaks. I am really having a hard time dealing with our vets answer about the meds and the money we spent each month poisoning our dog. After all my research it appears that our vet isn't a very good one and a lot of the people who had dogs w/ seizures had the same problem. So changing vets or getting 2nd opinions is probably a good idea for everyone who has a dog w/ seizures or any bad disease or problem. Good Luck, my thoughts are with all of you and your pets. Ivermectin has been implicated in contributing to seizures. Try high doses of Taurine. Our Ridgeback has been on Keppra and was seizure free for 3.5 months and then started having them frequently again. Supplemented with 1000 mg twice daily and she hasn't had one in the last 17 days. Mind you we were at one seizure every 8 hours prior to supplementing. Had an additional script of gabapentin that our vet prescribed but haven't needed to use it! Yes, yes, yes, advantix can cause seizures! Advantix started causing monthly cluster seizures 21/2 years ago. We never saw the correlation until 4 months ago. We took him off flea meds all together and 4 months have gone by and no seizures. They stopped altogether after they had been predictable for over 26 months. They are terrible and had altered my dogs behavior and personality. I hate that my decisions put him through this. Yes, Advantix can cause seizures. I have a Golden Retriever and finally realized every time we put Advantix or Frontline on her she would have several seizures!!! I finally realized that seizures were coinciding with the applications. After no longer using it, the seizures stopped. I feel terrible that I didn't figure it out sooner!! :-( Now we need to find another flea treatment that doesn't have any of the same active ingredients. I'm contemplating an oral flea medicine now. It's called Capstar. Has anyone had adverse reaction with this? Active ingredient is different is Nitenpyram, which is different from the active ingredients in Advantix & Frontline. 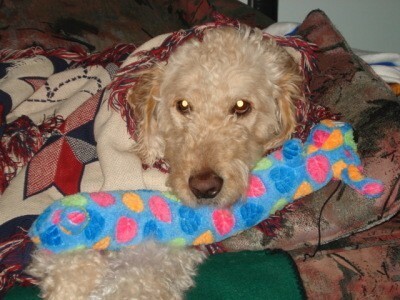 My 2 years old Goldendoodle had a severe seizure this morning. First seizure ever! Asking my girlfriend about any diet change or medication she told me she applied advantix 2 less then 48 hours ago. It was the first dose. This product deifnitively cause seizure. We are stopping it right away. There is an all natural product called Ruff on Bugs - made by the same people as their human proxy Mighty No Bitey. You can order it on line. One of my Dogs was having seizures 2 to 4 days after i gave him Frontline so when i talked to my vet she told me to try Advantix so i did and i thought it was working and not giving my dog seizures then one happened again 2 to 4 days after i put it on him. He may have had seizures before that but i did not witness them because i was at work..who knows. I also heard people were having problems with Bravecta ? So right now he is not going to use anything until i can find something that works. I was thinking maybe try giving him a smaller dose every two week but before i do that i want to talk to my vet.